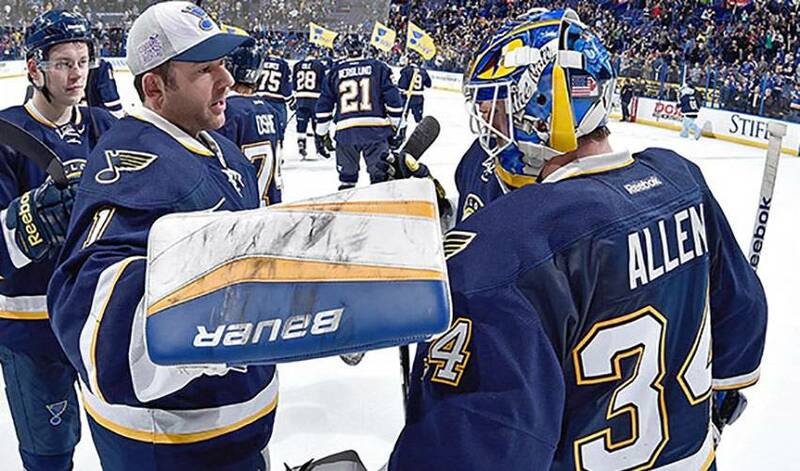 All good things must end – in this instance a four-game shutout streak – but St. Louis’ net gains, namely, the one-two goaltending punch of Jake Allen and Brian Elliott, are giving the Blues a major confidence boost heading into the Stanley Cup Playoffs. A first period goal by Colorado on March 29, in an eventual 3-1 win by St. Louis, snapped a streak of 258 minutes and 29 seconds without allowing a goal, but it hardly diminished the noticeable sense of pride in the Blues’ locker room. Three days earlier, Jake Allen had turned aside 32 shots as St. Louis blanked Eastern Conference heavyweights Washington in an authoritative 4-0 road victory. Aside from a franchise record of four straight clean sheets, the Blues became just the 11th team in NHL history to achieve the feat. It was Brian Elliott who delivered the first three blankings – a pair of wins against Vancouver, 3-0 and 4-0, and a 1-0 triumph over San Jose. The string of shutouts came on the heels of two losses and a combined 13 goals against. "It can be tough a little bit because (Allen has) been watching lately, and obviously (Elliott) has been playing unbelievable," St. Louis forward Paul Stastny told reporters after the Capitals win. "It's that internal competition that sometimes can be bad for you and sometimes can be good. These guys have found a way to make it competitive on a good standpoint that benefits the team." It’s a sentiment echoed by defenceman Alex Pietrangelo and captain David Backes. That support system has paid off handsomely for a team in search of its first championship. The last four post-seasons have yielded three conference quarterfinal exits and one conference semifinal loss. With a record of 11 wins and two losses in their last 13 starts, and the post-season looming, the Blues are looking for their dynamic duo to keep up their stellar play between the pipes. “The result has been two great options,” noted Backes.